How should I pick what channel type to use? When performing a relative change assessment, the key is to choose the same channel type for each scenario unless the scenario is designed to investigate the influence of channel properties specifically. However, if channel properties are known and used, model outputs should better reflect the real-world relationship between the channel properties and the shape, timing, and magnitude of the hydrograph. Channel width, channel roughness, and channel hydraulic conductivity are all sensitive parameters and work together to impact the shape and timing of hydrographs and flood peaks. Additionally, these parameters are more sensitive to each other at larger values. For example, if channel hydraulic conductivity is near zero, channel width and channel roughness will have smaller influence on channel infiltration. However, the larger the channel hydraulic conductivity is, the more influential channel width and channel roughness become to channel infiltration because they influence the area and the time available for infiltration. How should I pick the number of time steps to use for creating KINEROS precipitation files? 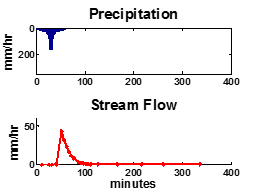 The number of time steps chosen for the creation of a design storm will have an effect on the peak rainfall intensity, which is a primary driver in the generation of overland flow. Too few steps will not represent peak intensities, and too many steps will create a very short spike in rainfall intensity. Something on the order of 10-15 steps/hour or ~1 step/5 minutes seems realistic for convective storms. Setting the number of time steps to 2 will effectively create a uniform intensity storm, despite the storm/hyetograph shape selection. How do I know if an error occurred and I wasn’t informed? The step in the AGWA process that is the most likely to fail without a warning is the parameterization step. One way to check to see if this step was completed successfully is to open ArcCatalog, open the geodatabase in your workspace that is associated to the watershed in question, and add the par_LUTs (parameter look up tables) to the map. Open the table to determine if there are any missing or null values for any parameterization in question. If all parameters are present and not null, the parameterization step succeeded. If there are missing parameter values (null values), the missing values can help you determine where in the watershed something went wrong, and whether the problem is related to the soils, land cover, or both. You can also check the C:\AGWA\logging\errors.txt file for errors. How do I pick what hydraulic geometry relationship (HGR) to use? When performing a relative change assessment, the key is to choose the same HGR relationship for each scenario unless the scenario is designed to investigate the influence of hydraulic geometry specifically. 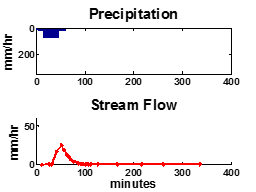 However, if channel geometries are known and used, model outputs should better reflect the real-world relationship between channel width and other channel properties and the shape, timing, and magnitude of the hydrograph. If channel measurements are available from field observations or high-resolution topographic data such as LIDAR, users can compare measurements at different locations in the watershed to pre-defined relationships to find a better relationship or to help define a custom HGR for a specific location. What is the stream definition methodology? How do I pick which one to use? The stream definition methodology determines how your watershed will be discretized, or broken up into discrete model elements. AGWA currently supports three different methodologies: threshold-based, existing stream network-based, and channel initiation points-based. The threshold-based methodology has a contributing source area (CSA) option and a flow length option. The CSA option has threshold defined in acres, hectares, or flow accumulation cells. The flow length option has threshold defined in meters. The CSA-based approach sets the upstream or contributing area required to define first-order channels. The flow length option sets the maximum overland flow length that can occur before a channel is defined. With a threshold-based methodology, smaller thresholds result in more model elements. The existing stream network-based methodology uses an existing stream network to define the starting points of the channel network in the discretization. The upstream nodes of the existing stream network are snapped to the flow accumulation raster, which is a DEM-derived representation of the stream network. The snapped nodes are then followed down the DEM-derived stream network down to the watershed outlet to define the channel network. Note that this methodology does not guarantee the discretization stream network will match the existing stream network because the existing stream network is not burned in to the DEM. The channel initiation points-based methodology uses a point theme to define the starting points of the channel network in the discretization. This methodology is very similar to the existing stream network-based methodology with the exception that a point theme is used instead of a polyline theme to define the channel initiation points. Picking the correct stream definition methodology depends on the application and the goals. The best methodology may be different for everyone, even when modeling the same watershed, because the modeling applications and goals may be different. If using a threshold-based methodology, one way to pick a threshold is to perform a discretization with the default 2.5% CSA and then compare the resulting channel network to observed data or other maps of drainage networks (NHD, ortho, local, etc.) and then adjust the threshold down or up on a subsequent discretization to better match. Finally, here are a few things to keep in mind when selecting your discretization options. When thresholds are set too low for the resolution of the DEM, an unrealistic channel network (parallel channels) will be derived. This can also in the non-threshold-based methodologies if the existing stream network or channel initiation points are of a higher resolution than the DEM. Another thing to consider when choosing a methodology is that the higher density channel network your discretization has, the more that the model runs will be dominated by channel characteristics. Because the changes to the system that we want to model are on the hillslopes, a good practice would be to optimize the element size such that a realistic channel network is obtained while the spatial heterogeneity of the hillslopes (slope, soils, land cover, and precipitation) are maintained. What is the largest recommended watershed size? While there are no limits on the range of sizes which can be modeled, there are guidelines which reflect the assumptions of the models being used or of the specific application. For example, KINEROS2 has been thoroughly validated for basin areas around 150 square kilometers. KINEROS2 is also an event-based model, so the geographic extent of precipitation events should inform the appropriate size watersheds if representing real-world conditions. SWAT, on the other hand, is a continuous, long-term yield model that has been validated on small watersheds (<10 square kilometers; http://ddr.nal.usda.gov/handle/10113/1347) up to continental scale applications (http://dx.doi.org/10.1016/j.jhydrol.2015.03.027). It should also be noted watershed size is less relevant when using the models to evaluate relative change for scenario analysis. For more information about the models in AGWA consult the documentation or publications. What is the AGWA Temp directory? This directory contains temporary files created by AGWA during certain steps like watershed delineation, discretization, or parameterization. It is set via the AGWA Preferences form in the AGWA Tools -> Other Options Menu. This folder should be periodically cleared out to maintain a clean working space. What is the Workspace directory? What is in it? The Workspace directory is the location that watershed delineations are created as feature classes in geodatabases named according to the delineation name. It is set during the delineation step, or, alternatively, can be set for all delineations created in a map document via the AGWA Preferences form in the AGWA Tools -> Other Options Menu. The Workspace location also contains a directory named according to the delineation name. In the delineation directory, subdirectories are created for each discretization created, and in the discretization subdirectories are precip, multipliers, and simulations subdirectories that contain the model input and output files. This logically organizes inputs and outputs to help prevent inadvertent mixing between discretizations and also allows more flexibility in naming precipitation inputs and model simulations. What is the AGWA Home directory? What is in it? The AGWA Home directory is a directory that contains a number of files required by AGWA. It is set via the AGWA Preferences form in the Other Options Menu. The required files include look-up tables and other files containing information required to parameterize and set up model runs, the model executables, and the AGWA documentation . The AGWA Home directory must be set for every ArcMap map document (.mxd file) before the map document may be used with AGWA, and it must also be intact with the required files and directories. For consistency and ease of use, all AGWA tutorials place the AGWA Home directory on your computer’s C: drive, however the directory may be located at your discretion. Files in this directory can be more closely examined by users and, in some cases, edited to better represent conditions specific to an application, location, or watershed. Below is a brief outline of the AGWA directory structure. \AGWA\datafiles– This folder contains a variety of files that are used in the hydrologic models contained in AGWA. Some of these files include land cover look-up tables, soil texture look-up tables, precipitation database tables (for KINEROS2), weather generating files (for SWAT), and channel geometry and type tables. \AGWA\documentation– This folder contains a user guide for AGWA which can be consulted for general questions regarding the tool and it’s component models. \AGWA\logging– This folder contains a text file that is generated when an error occurs while running AGWA. Some error messages may give users hints as to what triggered the error. \AGWA\models– This folder is home to all of the models utilized in AGWA; some of these models can be executed outside of AGWA but users need to be familiar with the types of information required to execute a model. The Automated Geospatial Watershed Assessment (AGWA) tool is a GIS-based hydrologic modeling tool that uses commonly available GIS data layers to fully parameterize, execute, and spatially visualize results for the RHEM, KINEROS2, KINEROS-OPUS, SWAT2000, and SWAT2005 watershed runoff and erosion models. Accommodating novice to expert GIS users, it is designed to be used by watershed, water resource, land use, and resource managers and scientists investigating the hydrologic impacts of land-cover/land-use change in small watershed to basin-scale studies . AGWA is currently available as AGWA 1.5 for ArcView 3.x, AGWA 2.x for ArcGIS 9.x, and AGWA 3.X for ArcGIS 10.x. Where is AGWA being used? evaluation of relative non-point source pollution. What data do I need to run AGWA? Where can I download it? At a minimum, AGWA requires a digital elevation model (DEM), raster-based land cover data, and feature-based soils data. It is also recommended to have observed precipitation data or, at the very least, precipitation data that is representative of the region to be modeled. AGWA is designed to be used with geospatially referenced data, which includes most data types supported by ArcGIS, namely feature classes and rasters. Imagery can be used for reference within a view, but cannot be used directly by AGWA unless it is classified to represent land cover. Below are several links to websites where data required by AGWA are located. The list is not comprehensive. Do I need a special license to run AGWA? For AGWA 2.0 and newer, AGWA requires a “Basic” license for ArcGIS for Desktop and the Spatial Analyst license and extension for ArcMap. An “Advanced” license is required for Thiessen weighting of SWAT rain gages. For AGWA 1.5, AGWA requires a valid installation of ArcView 3.x and the Spatial Analyst license and extension for ArcView 3.x. What is the best place to get AGWA support? Support is available through our AGWA Support Google Group and also available via phone. Please see our Contact/Support page for more information.